Guess who planted a lot of Wild Garlic bulbs last year in the woodland area of the garden? OK, it was me and Erik. And now we are going to reap the benefit. Like most plants in East Yorkshire, what with the gentle winter and warmer temperatures than usual, our Wild Garlic has already sprung through the soil, it’s wide arrow-shaped, bright green leaves waving at us, and emerging from the protective centre of these leaves are the little buds that are going to open out into the most beautiful of white star-shaped flowers, perfect for decorating a plate of food. The photo taken below was from the woodland area of our Hornsea garden last spring. There was only a tiny bit of Wild Garlic, but now we’ve got a much larger patch – everybody has warned us that it will take over the garden, but we don’t mind at all! Erik was inspired to sift through our recipe books and research, and found the perfect recipe to use from Sarah Raven’s Garden Cookbook. Yield: Fills a large jar. Erik found this recipe for Wild Garlic Pesto in Sarah Raven's Garden Cookbook, a font of all knowledge, especially if you grow a lot of your own fruit and vegetables. The recipes are absolutely delicious. But Erik also decided to use some of this Wild Garlic Pesto to mix with softened butter, then rolled it into a round, barrel shape, covered it with cling film, and he will either keep it very cool in the fridge or freeze it. When you want to flavour a steak or pasta, with a knife dipped in warm water, just cut a slice off the flavoured butter, wrap it up again and use for another day. Delicious. 200ml extra virgin olive oil, plus more for sealing jar. 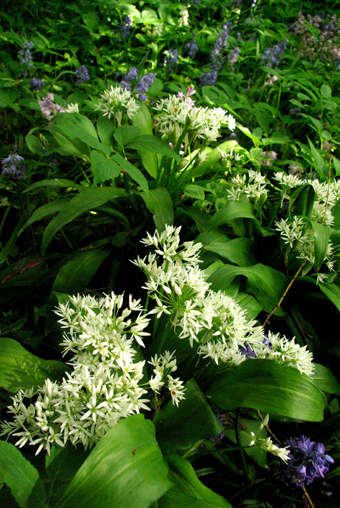 Blanch the wild garlic leaves in boiling water for about 10 seconds. Refresh in very cold water and pat dry on kitchen paper. Put the wild garlic, olive oil, pine nuts or walnuts, together with the garlic cloves, into a food processor and blend to a puree. Transfer to a bowl and mix in the grated parmesan. Season careful with salt and pepper, and put into the sterilised glass jar. Pour over a little extra virgin olive oil and seal to cover tightly.